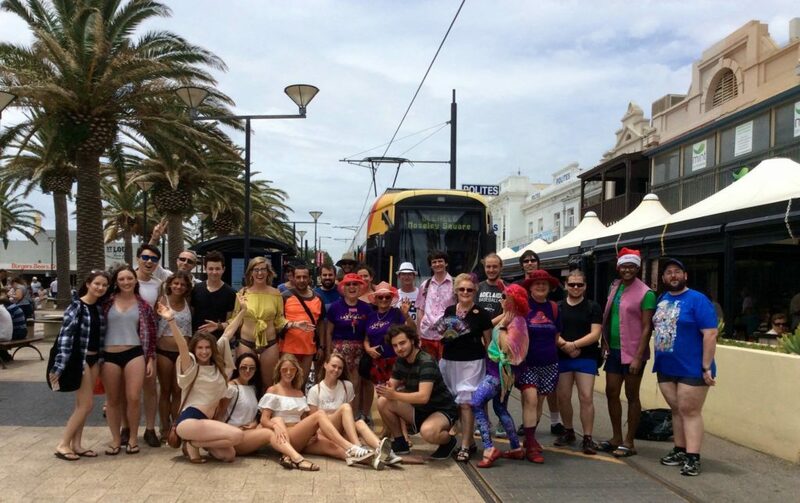 Thanks to everyone who made it out today to our 10 year anniversary event of the No Pants Tram Ride in Adelaide! The weather was great and we had a solid turnout of 31 people. Everyone reported they had great fun. 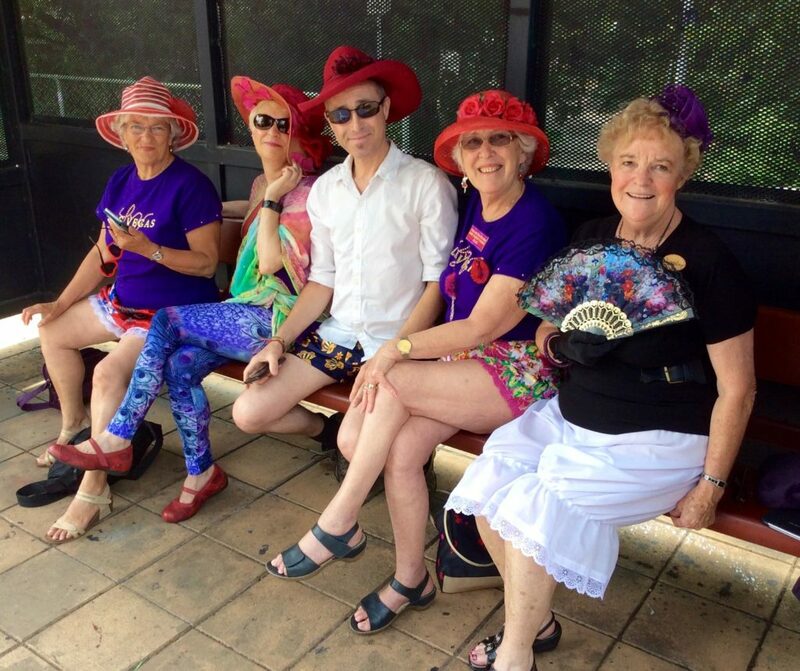 I want to give a special shout-out to our regular attendees; the Adelaide Red Hatters group as well as Daniel and Tess who have all been back for the last 4 – 6 years! Thanks to our wonderful Pants collectors, you guys did an awesome job (especially in the circumstances, more on that below)! We also need to give a hat tip to Improv Everywhere who are the original inventors and custodians of this event with their annual No Pants Subway Ride in New York, started back in 2002. The IE event in New York gets thousands of attendees these days and even Brisbane’s event get a few hundred people, which makes our standard turnouts of around 30 people look a bit small. 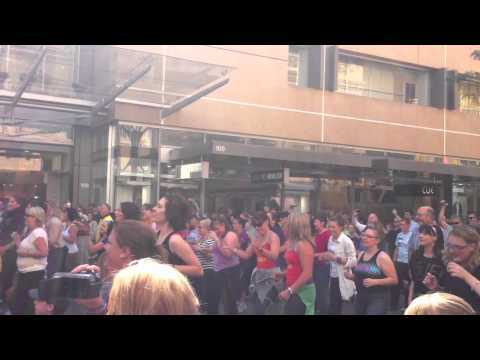 However, considering Adelaide is a conservative city in many ways and that we have a much smaller population I think we do quite well and I’m very proud to make it to ten years and have been involved in creating this event which brings participants and spectators so much joy. I want to give a final thanks to all our organisers, filmers, photographers and participants over the last 10 years, you guys rock! Go here to check out the 10 year history of this event in Adelaide and read on below for a short report from this year and some photos. This will just be a short report as our past reports cover most of the ins and outs of this event. I (Nick) missed the event for the last two years as I was overseas so I was looking forward to getting back behind the reigns for this event. Unfortunately I found myself on crutches the day before which made things a bit dicey but it all turned out alright and I had a good excuse to sit still on the tram (rather than moving around as I normally would do) and take in the event as any other tram rider would. We had a really great bunch of partici-pants this year including first timers and returning attendees (some have been coming back for over 5 years now! ), nearly equal proportions of males and females and a wide range of ages. One guy was late to the meeting point and missed us but randomly hopped on a tram and managed to catch up with us and join in. The ride down went well with many great photos emerging from the groups at each stop. 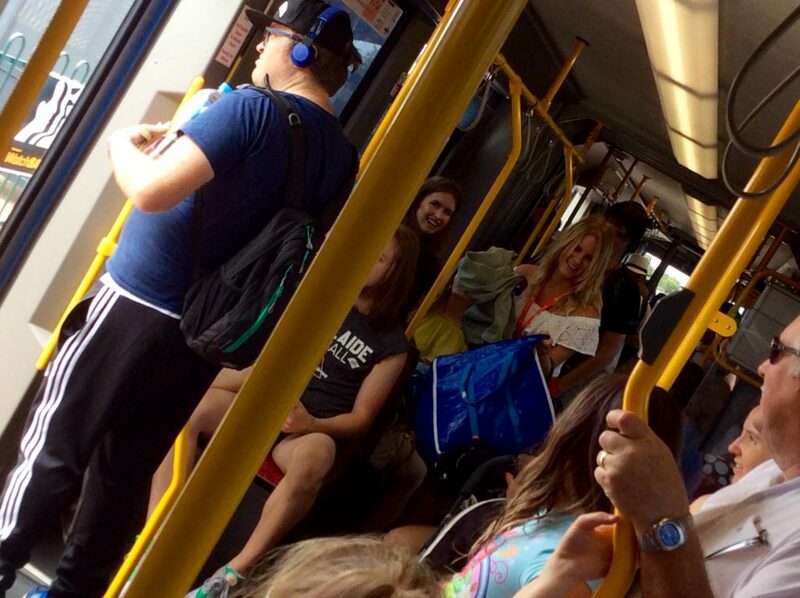 Our stop had quite a few other people waiting which results in a few sideways glances. 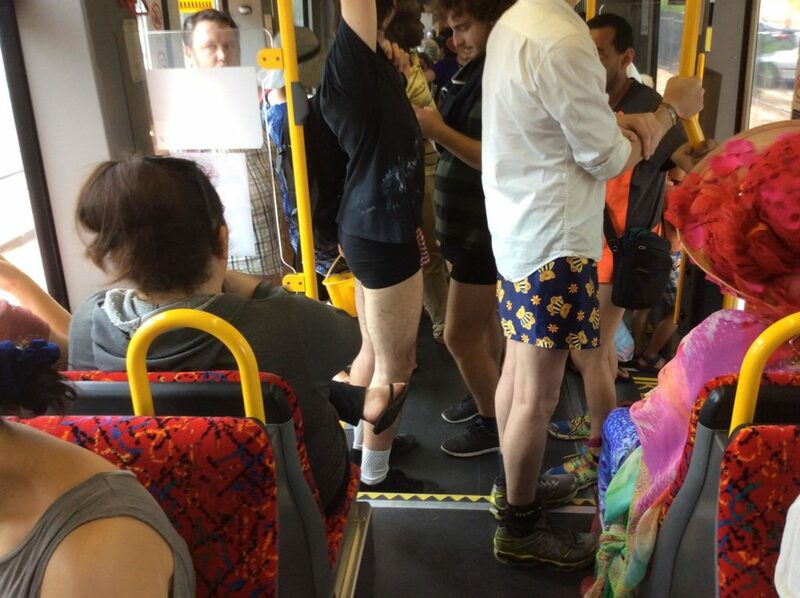 I have to give a special mention to a group of girls who came up with a great ‘you’ve got a spider in your pants’ routine to justify their de-pantsing on the first tram. Unfortunately it happened right after I got off so I missed it but I’m told it was hilarious! Glenelg was super busy and we no doubt provided a curious site for those enjoying their lunch and ice creams. 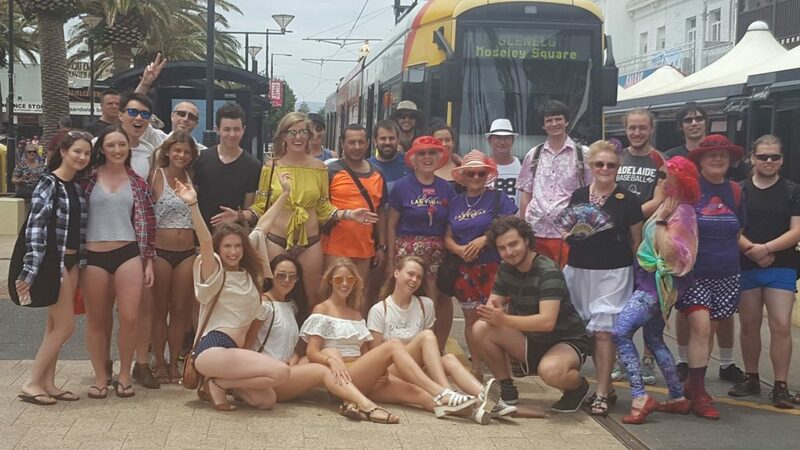 We were able to get in a nice group photo (above) and then a few people departed but about 2/3rds decided to head back into town with us where we would run our ‘Pants for Peace’ routine which is a variation on the standard no pants ride and something we came up with in Adelaide. 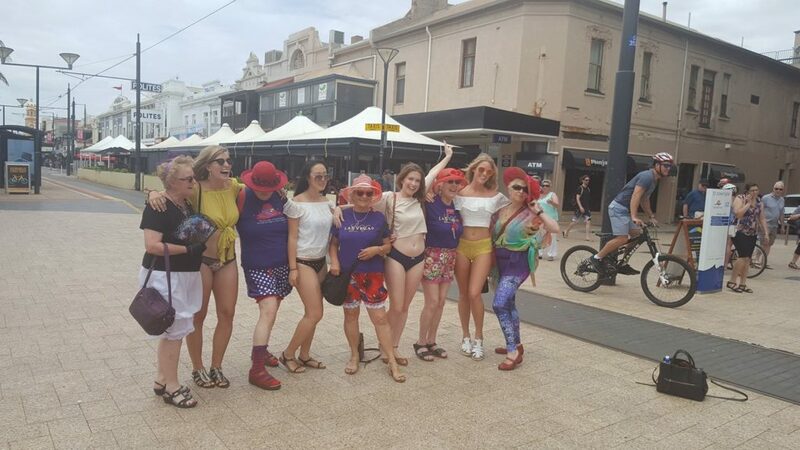 Our pants collectors (Pants for Peace representatives) did a great job with their spiel and collecting but unfortunately we were asked by an Adelaide Metro staff member to re-pants before the ride was out so that was a bit disappointing. This was the first time we’ve had any trouble but its possible we got a little rowdier than normal which may have set them off. We can’t really blame the staff member as they were just trying to do their job on a busy tram day so no hard feelings there and everyone still had a great day overall.